If you've ever wondered where a vintage toyshop gets its toys, well, we have a variety of sources. Often collectors (or their heirs) want to downsize those collections. Sometimes I find nice toys at estate sales. 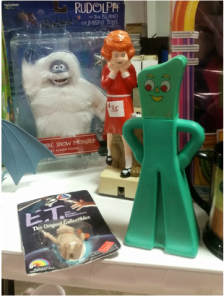 I've even found interesting things in thrift stores. But some of my favorite places to score old dolls, toys, and games are garage and yard sales. It usually goes something like this. Mom has kept all her kids' junk for just too many years, and now she wants to convert that old bedroom into a sewing room/home office/media room. So if the kids don't want it, why not sell all this stuff? So she hauls it all out to the garage/driveway/yard and puts stickers on it all. Now, if you're building a toy (or any other collection, really) from garage sale finds, I've learned a few good tips I can pass along. 1. Never pay full price. Learn the lingo for negotiating. "Will you take..." and "What's the best price you can do on this?" I was very shy about this at first, but people have come to expect it, and I haven't died yet. The worst they can do is say no. 2. Buy in bulk. When I see a stack of games, I usually pick up all of them. I know Cathy sometimes does that when she buys costume jewelry. It's impossible to know what everything is worth. We've both found special treasures among those extra things we picked up along with that shiny item we initially wanted. 3. Don't tip your hand. Here's some advice I've just never been able to follow. Occasionally, you run into a real bargain: an expensive item that you know is worth a LOT more than what the seller is asking. I suppose there would be nothing wrong with talking it down and getting that deal, but I always find myself telling the seller. That whole golden rule thing. 4. Keep an open mind. One of the worst things you can do is go out looking for something particular. Garage sales just don't work like that. 5. Plan your route. I always look for clusters of yard sales and larger multi-family sales. Block sales are even better. Question: Do you enjoy garage or yard sales? What interesting things have you found? I only go if it is convenient. I never go looking. I've had bunches of garage sales. The last ones were in preparation for downsizing and moving to the opposite end of the state. Unlike a lot of folks, I try to research what I'm selling to see if there is any value in it before plastering a quarter sticker on it. Advice on the selling end would be - don't be afraid to put out what you consider junk. It really is true that one person's junk is another's treasure. I do go to sales occasionally but as I get older my choices and what I look at are more limited cause you seem to look at things thinking "does it need to be dusted". LOL My biggest bargain was for an almost new transit that my husband was needed for survey work. I like garage sale & yard sale shopping, however, I have to be in the right mood for them. I'm at that age where I don't need to add to clutter in my house, so I seldom go to garage sales. It was different when my kids were little and money was tight.